1. Notely RG, Beaugie JM. The long term follow-up of Anderson-Hynes pyeloplasty for hydronephrosis. Br J Urol 1973; 45:464. 2. Persky L, Krause JR, Boltuch RL. Initial complications and late results in dismembered pyeloplasty. J Urol 1977; 118:162. 3. Motola JA, Badlani GH, Smith AD. Results of 212 consecutive endopyelotomies: an eight-year follow up. J Urol 1993; 149:453. 4. Nakada SY, Johnson M. Ureteropelvic junction obstruction: retrograde endopyelotomy. Urol Clin North Am 2000; 27:677. 5. McClinton S, Steyn JH, Hussey JK. 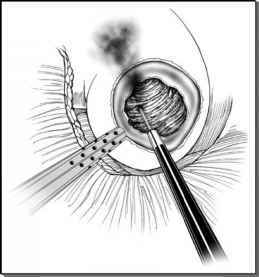 Retrograde balloon dilatation for pelviureteric junction obstruction. Br J Urol 1993; 71:152. 6. Lechevallier E, Eghazarian C, Ortega JC, Andre M, Gelsi E, Coulange C. Retrograde acucise endopyelotomy: long term results. J Endourol 1999; 13:575. 7. Schuessler WW, Grune MT, Tecuanhuey LV, Preminger GM. Laparoscopic dismembered pyeloplasty. J Urol 1993; 150:1795. 8. Kavoussi LR, Peters CA. Laparoscopic pyeloplasty. J Urol 1993; 150:1891. 9. Chen RN, Moore RG, Kavoussi LR. Laparoscopic pyeloplasty. Indications, technique, long term outcome. Urol Clin North Am 1998; 25:323. 10. Soulie M, Salomon L, Patard JJ, et al. Extraperitoneal laparoscopic pyeloplasty: a multicenter study of 55 procedures. J Urol 2001; 166:48. 11. Eden CG, Cahill D, Allen JD. Laparoscopic dismembered pyeloplasty: 50 consecutive cases. BJU Int 2001; 88:526. 12. Jarrett TW, Chan DY, Charambura TC, Fugita O, Kavoussi LR. Laparoscopic pyeloplasty. J Urol 2002; 167:1253. 13. Tan HL. Laparoscopic Anderson-Hynes dismembered pyeloplasty in children. J Urol 1999; 162:1045. 14. Yeung CK, Tam YH, Sihoe JDY, Lee KH, Liu KW. Retroperitoneoscopic dismembered pyeloplasty for pelviureteric junction obstruction in infants and children. Br J Urol 2001; 87:509. 15. Moore RG, Averch TD, Schulam PG, Adams JB, Chen RN, Kavoussi LR. Laparoscopic pyeloplasty: experience with the initial 30 cases. J Urol 1997; 157:459. 16. Janetschek G, Peschel R, Bartsch G. Laparoscopic Fenger plasty. J Endourol 2000; 14:889. 17. Marcovich R, Jacobson AI, Aldana JP, Lee BR, Smith AD. Practice trends in contemporary management of adult ureteropelvic junction obstruction. Urology 2003; 62:22. 18. Nakada SY, McDougall EM, Clayman RV. Laparoscopic pyeloplasty for secondary ureteropelvic junction obstruction: preliminary experience. Urology 1995; 46:257. 19. Sundaram CP, Grubb RL III, Rehman J, et al. Laparoscopic pyeloplasty for secondary ureteropelvic junction obstruction. J Urol 2003; 169:2037. 20. Ramakumar S, Lancini V, Chan DY, Parsons JK, Kavoussi LR, Jarrett TW. Laparoscopic pyeloplasty with concomitant pyelolithotomy. J Urol 2002; 167:1378. 21. Chen RN, Moore RG, Kavoussi LR. Laparoscopic pyeloplasty. J Endourol 1996; 10:156. 22. Bauer JJ, Bishoff JT, Moore RG, Chen RN, Iverson AJ, Kavoussi LR. Laparoscopic versus open pyeloplasty: assessment of objective and subjective outcome. J Urol 1999; 162:692. 23. Recker F, Subotic B, Goepel M, Tscholl R. Laparoscopic dismembered pyeloplasty: preliminary report. J Urol 1995; 153:1601. 24. Janetschek G, Peschel R, Altarac S, Bartsch G. Laparoscopic and retroperitoneoscopic repair of ureteropelvic junction obstruction. Urology 1996; 47:311. 25. Siqueira TM Jr., Nadu A, Kuo RL, Paterson RF, Lingeman JE, Shalhav AL. Laparoscopic treatment for ureteropelvic junction obstruction. Urology 2002; 60:973. 26. Turk IA, Davis JW, Winkelmann B, et al. Laparoscopic dismembered pyeloplasty—the method of choice in the presence of an enlarged renal pelvis and crossing vessels. Eur Urol 2002; 42:268. 27. Brooks JD, Kavoussi LR, Preminger GM, et al. Comparison of open and endourological approaches to the obstructed ureteropelvic junction. Urology 1995; 46:791. 28. Klingler HC, Remzi M, Janetschek G, Kratzik C, Marberger MJ. Comparison of open versus laparoscopic pyeloplasty techniques in treatment of uretero-pelvic junction obstruction. Eur Urol 2003; 44:340. 29. Pardalidis NP, Papatsoris AG, Kosmaoglou EV. Endoscopic and laparoscopic treatment of ureteropelvic junction obstruction. J Urol 2002; 168:1937. 30. Brooks JD, Kavoussi LR, Preminger GM, Schuessler WW, Moore RG. Comparison of open and endourologic approaches to the obstructed ureteropelvic junction. Urology 1995; 46:791. 31. Soulie M, Thoulouzan M, Seguin P, et al. Retroperitoneal laparoscopic versus open pyeloplasty with a minimal incision: comparison of two surgical approaches. Urology 2001; 57:443. 32. Puppo P, Perachino M, Ricciotti G, Bozzo W, Pezzica C. Retroperitoneoscopic treatment of ureteropelvic junction obstruction. Eur Urol 1997; 31:204. 33. Ben Slama MR, Salomon L, Hoznek A, et al. Extraperitoneal laparoscopic repair of ureteropelvic junction obstruction: initial experience in 15 cases. Urology 2000; 56:45. 34. Peters CA, Schlussel RN, Retik AB. Pediatric laparoscopic dismembered pyeloplasty. J Urol 1995; 153:1962. 35. El-Ghoneimi A, Farhat W, Bolduc S, et al. Laparoscopic dismembered pyeloplasty by a retroperitoneal approach in children. BJU Int 2003; 92:104. 36. Olsen LH, Jorgensen TM. Computer assisted pyeloplasty in children: the retroperitoneal approach. J Urol 2004; 171:2629. 37. Sung GT, Gill IS. Robotic laparoscopic surgery: a comparison of the da Vinci and Zeus systems. Urology 2001; 58:893. 38. Yohannes P, Rotariu P, Pinto P, Smith AD, Lee BR. Comparison of robotic versus laparoscopic skills: is there a difference in the learning curve? Urology 2002; 60:39. 39. Gettman MT, Neururer R, Bartsch G, Peschel R. Anderson-Hynes dismembered pyeloplasty performed using the da Vinci robotic system. Urology 2002; 60:509. 40. Gettman MT, Peschel R, Neururer R, Bartsch G. A comparison of laparoscopic pyeloplasty performed with the daVinci robotic system versus standard laparoscopic techniques: initial clinical results. Eur Urol 2002; 42:453. 41. Gupta M, Tuncay OL, Smith AD. Open surgical exploration after failed endopyelotomy: a 12-year perspective. J Urol 1997; 157:1613. 42. Scardino PT, Scardino PL. Obstruction at the ureteropelvic junction. In: Bergman H, ed. The Ureter. 2nd ed. New York: Springer-Verlag, 1981:697. 43. Cassis AN, Brannen GE, Bush WH, Correa RJ, Chambers M. Endopyelotomy: review of results and complications. J Urol 1991; 146:1492. 44. Meretyk I, Meretyk S, Clayman RV. Endopyelotomy: comparison of ureteroscopic retrograde and antegrade percutaneous techniques. J Urol 1992; 148:775. 45. Gaur DD, Agarwal DK, Purohit KC, Darshane AS. Retroperitoneal laparoscopic pyelolithotomy. J Urol 1994; 151:927. 46. Micali S, Moore RG, Averch TD, Adams JB, Kavoussi LR. The role of laparoscopy in the treatment of renal and ureteral calculi. J Urol 1997; 157:463. 47. Segura JW, Kelalis PP, Burke EC. Horseshoe kidney in children. J Urol 1972; 108:333. 48. Gleason PE, Kelalis PP, Husmann DA, Kramer SA. Hydronephrosis in renal ectopia: incidence, etiology and significance. J Urol 1994; 151:1660. 49. Pitts WR Jr., Muecke EC. Horseshoe kidneys: a 40-year experience. J Urol 1975; 113:743. 50. Das S, Amar AD. Ureteropelvic junction obstruction with associated renal anomalies. J Urol 1984; 131:872. 51. Jabbour ME, Goldfischer ER, Stravodimos KG, Klima WJ, Smith AD. Endopyelotomy for horseshoe and ectopic kidneys. J Urol 1998; 160:694. 52. Bove P, Ong AM, Rha KH, Pinto P, Jarrett TW, Kavoussi LR. Laparoscopic management of ureteropelvic junction obstruction in patients with upper urinary tract anomalies. J Urol 2004; 171:77. 53. Hsu TH, Presti JC Jr. Anterior extraperitoneal approach to laparoscopic pyeloplasty in horseshoe kidney: a novel technique. Urology 2003; 62:1114. Department of Urology, North Shore-Long Island Jewish Medical Center, New Hyde Park, New York, U.S.A.
most often choose between an endopyelotomy or laparoscopic pyeloplasty for definitive treatment of ureteropelvic junction obstruction rather than even consider an open approach primarily. Laparoscopy, in particular, is playing an increasing role in ureteropelvic junction management and has proven to be a viable alternative for patients with ureteropelvic junction obstruction. As in the open technique, a tension-free mucosa-to-mucosa watertight anastomosis will dictate operative success. In turn, such success is contingent on proficiency with laparoscopic suturing, a skill that has become easier to acquire with the aid of robotics (2), handassisted laparoscopy (3), and newly described laparoscopic instrumentation and techniques (4,5). In the last decade, approximately 16 series have reported on laparoscopic pyeloplasty for the treatment of primary ureteropelvic junction obstruction. Anderson-Hynes dismembered pyeloplasty, Y-V plasty, and Fengerplasty, which have all been described utilizing either a transperitoneal or retroperitoneal approach. Most impressive are the overwhelming success rates (>95%) in the large majority of these patients with operative times ranging from two to four hours. Few series, however, have compared data on the open versus laparoscopic approach at their respective institutions. Bauer et al. (6), for example, represent the minority to do so demonstrating comparable outcomes between open and laparoscopic groups with regard to relief of obstruction, relief of symptoms, and improved activity. Future efforts in follow-up studies must focus on defining "success rates" prospectively in a stratified and uniform manner. Outcomes, for example, in terms of pre and postoperative renal function (i.e, T^ emptying time) and objective pain scales will give us the agency to truly compare minimally invasive techniques and determine which method is arguably most successful. Comparisons between minimally invasive treatments for ureteropelvic junction obstruction have been made. In a multivariate analysis, Gill et al. (7) demonstrated that laparoscopic pyeloplasty was more successful (95.5%) than percutaneous endopyelotomy (86%), ureteroscopic endopyelotomy (85%), or electrocautery balloon endopyelotomy (76.7%). Why was laparoscopy superior? Were the preoperative parameters capable of foretelling such success? Massive hydronephrosis, poor renal function, stenotic segments greater than 1 cm, and a large renal pelvis draped over a renal vessel, for example, may be predictors of such success if a laparoscopic approach is used. It is important to note that it is still debatable as to whether or not "crossing vessel(s)" are truly significant in the etiology of ureteropelvic junction obstruction (8). Until the significance of this anatomic entity is better elucidated, treatment should not necessarily be dictated based on its presence. Conversely, absence of the aforementioned anatomical variants suggests that there is more of an indication to utilize an endopyelotomy as the primary treatment modality. To this end, Pardalidis et al. (9) reported a success rate of 95% when patients were well selected for either endopyelotomy or laparoscopy based on such anatomical differences. Currently, this appears to be the general practice trend among academic endourologists in North America (10). It is evident that success in approaching a ureteropelvic junction obstruction may not necessarily rely on which minimally invasive technique is used but rather which procedure is utilized on an individual basis. The pediatric population may be the most important group to focus on when analyzing the benefits of new technology for the treatment of uretero-pelvic junction obstruction. Similar to adult cohorts, laparoscopic pyeloplas-ties in three pediatric series have demonstrated success rates from 87% to 100%. The dismembered pyeloplasty has been deemed the ultimate challenge in pediatric urological laparoscopy, as fine suturing with small instrumentation is required (11). Robotics may aid the pediatric urologist in this demanding operation, serving as a model for the adult urologist wishing to acquire better laparoscopic suturing skills. Future prospective and well-stratified studies in the pediatric population will especially give us a clearer view of the effect of laparoscopy on renal development and functionality over time. Results with pediatric endopyelotomy have yielded poor results that have been attributed to the difficulties encountered with ureteral stenting. Further development in pediatric endopyelotomy is needed. There is no doubt, however, that laparoscopic approaches to ureteropelvic junction obstruction in the pediatric population will soon challenge the open technique as the standard of care. A secondary ureteropelvic junction repair poses a challenge for the laparoscopist. Adhesions and fibrosis may limit exposure and prolong operative times. Despite this, minimally invasive salvage procedures yield a greater than 80% success rate. Salvage procedures for failed primary laparoscopic pyeloplasties are best served with an endopyelotomy. Conversely, failed primary endopyelotomies are best served with a laparoscopic pyeloplasty. Laparoscopic pyeloplasty with concomitant pyelolithotomy has also emerged as a primary mode of treatment for instances of nephrolithiasis with a ureteropelvic junction obstruction. Although series reporting on this approach are few and demonstrate prolonged operative times, the feasibility of this technique has been demonstrated. It is our practice to evaluate the extent of edema at the ureteropelvic junction if repair is anticipated at the time of percutaneous nephrolithotomy. If there is no edema, endopyelotomy is performed. Conversely, the presence of edema calls for re-evaluation of the ureteropelvic junction with a functional study once all stones have been cleared and the edema has subsided. A ureteropelvic junction "obstruction" in the presence of nephrolithiasis may be a function of inflammation, precluding repair. Immediate laparoscopic pyeloplasty with concomitant pyelolithotomy may run the risk of unnecessary ureteropelvic junction "repair." Perhaps better technology fusing endoscopic technique during laparoscopy will further facilitate the employment of this procedure. Along the same line, laparoscopic pyelo-plasties performed for ureteropelvic junction obstructions in the presence of upper tract anomalies in horseshoe kidneys or ectopic kidneys have yielded equivalent results to the open approach. Although comparable success rates have been reported, such anomalies may present technical challenges (i.e., anomalous blood supply) requiring cases to be individualized only in highly skilled hands. A minimally invasive approach for the treatment of primary uretero-pelvic junction obstruction has certainly emerged as perhaps a "new gold standard." Laparoscopic pyeloplasty, in particular, is more widely utilized and has proven to be efficacious. It is specifically geared toward cases in which known anatomical variables preclude the likelihood of endoscopic success. In the very near future, it will be exciting to see how accelerations in endoscopic and laparoscopic refinements, "raise the bar" even higher for what we will consider or demand as standard of care in both the adult and pediatric populations with ureteropelvic junction obstructions. Operator experience coupled with ultimate advancements in laparoscopic suturing techniques and instrumentation will certainly decrease operative times, former minimize morbidity, and assure that patients undergoing laparoscopic pyeloplasties will be in near perfect stead. On the horizon, urinary markers such as tumor growth factor (12) and nuclear factor-kappa B (13) hold great promise as predictive markers for what might translate into a ureteropelvic junction obstruction repair success or failure, further aiding in our minimally invasive treatment decisions.